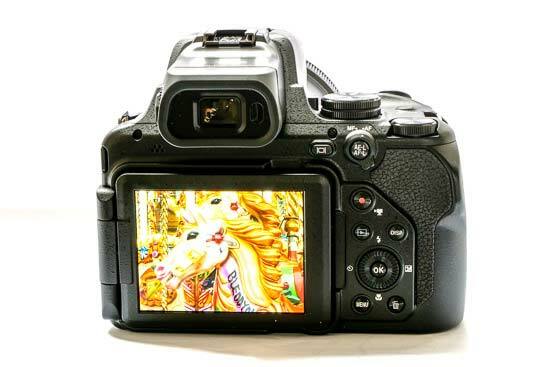 The Coolpix P1000 is a high-end, enthusiast-level bridge camera from Nikon. Its headline feature is its 125x optical zoom lens, which gives you a 35mm equivalent zoom range of 24-3000mm, making it unsurpassed in the market. 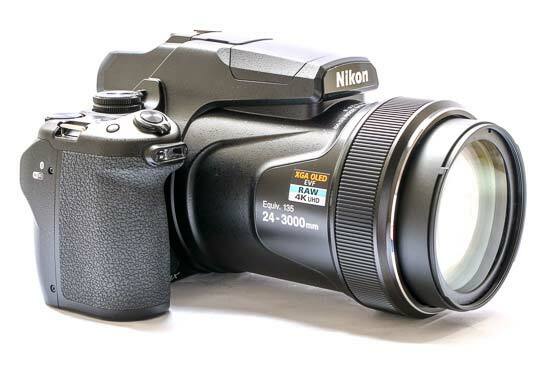 It follows on from the Nikon P900, which made its debut back in 2015, and features a 83x zoom. 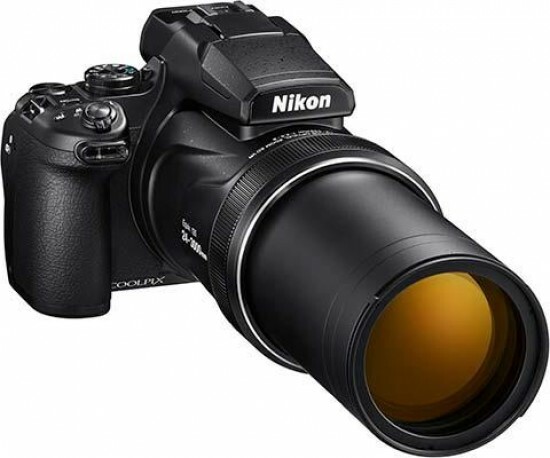 Aside from the zoom, the Nikon P1000's key specifications include a 1/2.3-inch 16 megapixel sensor, an f/2.8-f/8 maximum aperture range, a 0.39-inch, 2359k-dot electronic viewfinder, RAW format shooting, manual control and a 3.2-inch 921k-dot vari-angle TFT LCD. Another thing about the Coolpix P1000 that made headlines when it was announced is its price - it currently retails for around £999 / $999, so it’s by no means a cheap, or bargain proposition. 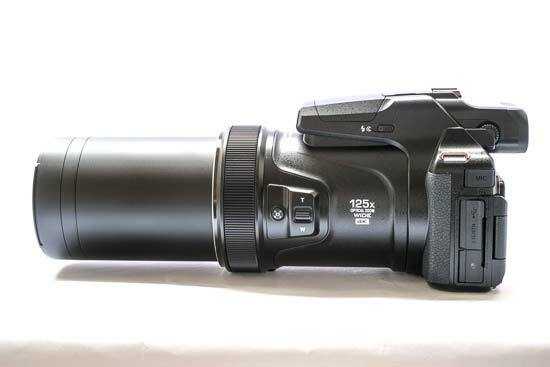 There are two ways to think about the Nikon P1000. It’s either massive compared to every other camera you’ve likely used - certainly a bridge camera - or it’s tiny considering the fact that it’s packing a 3000mm zoom. Either way, you’re certainly not going to be able to slip this into your pocket - even a bag you might struggle with. Of course because of the huge lens, the bulk of the camera is taken up by that, with a very wide lens diameter and very weighty feel to it. Again, you might think it’s lightweight compared to carrying the equivalent DSLR equipment around, but this is by no means a discreet model - and it gets even larger when you zoom the lens out, too. The Nikon P1000 is roughly DSLR-like in design, in that it has a deep, chunky grip, a familiar array of dials and buttons (familiar to DSLR users), and a viewfinder which sits in the middle of the back of the camera. The grip has a textured coating, while it is recessed in to accommodate your middle finger while your forefinger rests on the shutter release. Although almost all of the Nikon Coolpix P1000’s buttons are on the right hand side of the camera, it’s unlikely you’d be using this camera one handed - it’s just too heavy. You’ll need to use your second hand to balance the lens and keep it as steady as possible. Around the end of the lens barrel there’s a control ring, which you can customise to control different functions - but there are just three options (exposure compensation, ISO sensitivity and white balance). Alternatively you can switch it off and have the ring not control anything. On the side of the lens barrel is a zoom switch, which you can use to move the lens in and out, and the extremely useful “snap-back zoom” button. This can be used when you’re shooting at the far end of the telephoto zoom and something goes out of the frame - something which is especially common when shooting at such long focal lengths. By holding down this button, the lens will zoom out, allowing you to find your subject, and once you let go of the button, the zoom will resume to the same length. Found on the top of the grip is a mode dial, which contains all the usual automatic and semi-automatic modes (P,A,S) as well as manual mode. You’ll also find “Scene auto selector” as well as some special modes which are designed to make the most of the camera’s specific capabilities. There’s a “bird-watching” mode - which gives you the option to quickly jump to 500mm, and a “moon” mode - which gives you the option to quickly jump to 1000mm, as well as switching on a self-timer and giving you quick access to different white balance options. 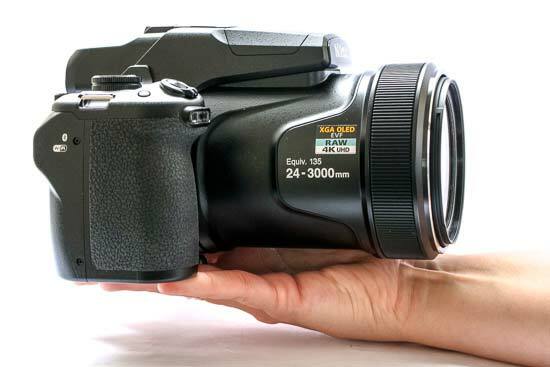 Another dial is found on the top of the Nikon Coolpix P1000, which can be used to adjust shutter speed when shooting in either manual mode or shutter priority. Around the shutter release button there is another zoom switch, which you can use instead of the zoom switch on the side of the lens if you prefer. 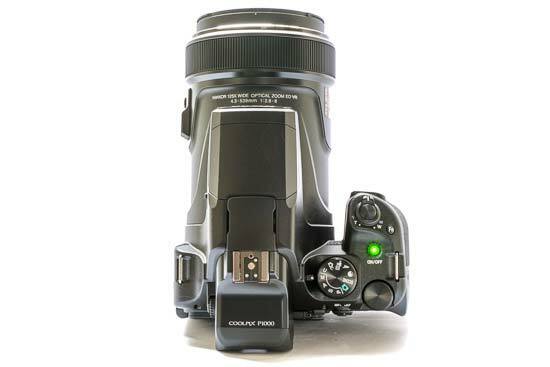 A small function button can be found just behind the shutter release, and can be customised to control a wide variety of different settings, including drive mode, ISO, white balance, Picture Control, AF area mode and so on. Flipping to the back of the P1000, and Nikon has used a familiar array of buttons to anybody who’s used a Nikon DSLR, or previous Nikon bridge camera before. For example, there’s a scrolling dial which doubles up as a four-way navigational pad, with different functions assigned to each key, including macro focusing, flash functionality, exposure compensation and self-timer. On the back, you’ll also find dedicated buttons for various functions, including video recording, a button to switch the viewfinder on and off, a playback button, a display button and a delete button. There’s also a menu button, which you can use to access the main settings of the camera. One button which is arguably missing from the P1000 is a “quick menu” option, but since most functions have a dedicated dial or button, it’s easy to see why one has been left off. The electronic viewfinder found on the back of the Nikon P1000 is one of the best viewfinders ever to grace a bridge camera - but it’s certainly no less than you’d expect from a camera with a retail price of £999. It shows a bright and clear view of the scene in front of you, with no noticeable lag. There is a sensor just next to the viewfinder which gives you a seamless transition between using the camera’s screen and switching to the viewfinder. Speaking of the screen, the P1000 has a fully articulating device. That makes it very useful for shooting from awkward angles, including for selfies and for video use. On the downside, the screen is not touch-sensitive, which is a bit of a shame for such an expensive camera. Sitting above the lens barrel is the camera’s inbuilt flash. It has a lengthy housing to ensure that the flash can stretch over the P1000’s huge zoom, and it can be released from the housing via a switch. The flash itself pops out quite high above the lens, and can just be pushed back into place when not in use. The Nikon Coolpix P1000 takes an EN-EL20a battery, and has an official CIPA rating of 250 shots. In real-terms, you’ll probably find that it lasts a little longer than that in most situations. It can be charged via USB. There is a single SD memory card slot found next to the camera’s battery. On the whole, focusing is quick and accurate when using the Nikon P1000. However, when the lens is zoomed to its full length, it can sometimes struggle to acquire focus on very distant subjects. Switching on vibration reduction (via the main menu) is an absolute necessity when using long focal lengths, but it keeps things relatively stable and smooth. That said, if you’re going to shoot something at 3000mm, using a tripod is the best way to ensure that your composition is exactly what you want - it’s very easy when working at this focal length to make a micro movement and completely change the framing.